Chiang Mai is a city built on the roots of a traditional heritage that dig deep into the soil of time. It’s a city with a beautiful cultural personality of its own. In addition, it’s been blessed with much majestic beauty in nature. 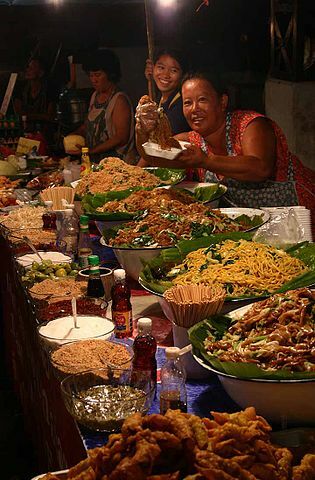 The people themselves are an unforgettable part of Chiang Mai. 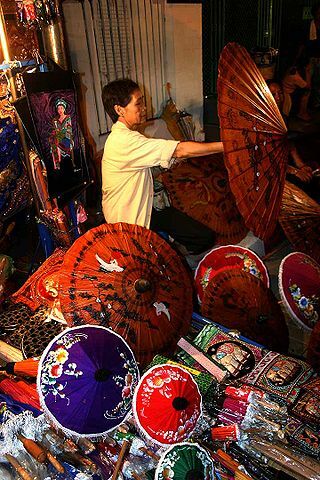 Handicrafts of silk, silver and wood are time less souvenirs for visitors from all over the globe. Along with all this, a wide variety of accommodations, restaurants, and entertainment all help to make Chiang Mai one of Thailand’s prime tourist attractions. Northern Thailand is characterized largely by forested mountains, where working elephants are still used in forest management. This mountainous region is home to Thailand’s many colorful hilltribe people, and trekking and river rafting enable adventurous exploration of this beautiful area. 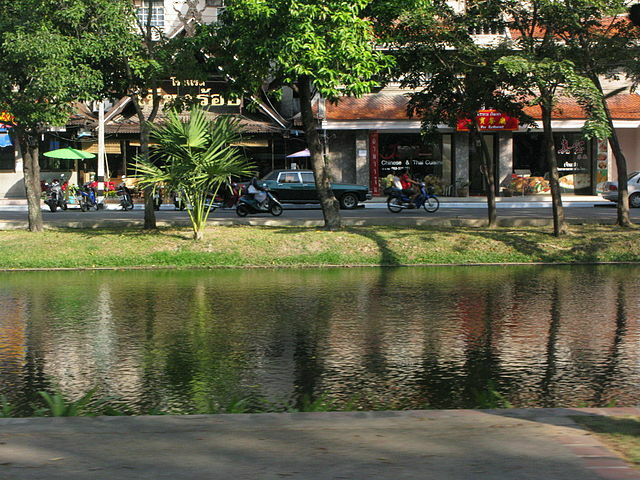 Chiang Mai is the principal norhtern city and is a good base from which to explore the surrounding countryside. Doi Inthanon National Park : The 1,005 – square – kilometre park covers Thailand’s highest mountain (2,565 metres). The lovely Wachirathan, Siriphum and Mae Pan waterfalls share the mountain with Meo and Karen hilltribe settlements. Forest above 1,800 metres is covered with lichens and wild orchids. Mae Klang Waterfall : Chiang Mai’s most photographed waterfall lies some 58 kilometres west of the city at the foot of Doi Inthanon Mountain, and provides a picturesque setting for picnics and relaxation. Borichinda Cave : Visiting the cave, which provides a pleasant setting for picnics, entails a 10-minute drive and a walk of some 2 hours from the Mae Klang Waterfall. Mae Ya Waterfall : This is located 12 kilometres from Chom Thong market and is best visited by local mini-bus. Ob Luang Gorge : This picturesque gorge is 88 kilometres from Chiang Mai provincial capital, and is framed by teak forests and mountains. National Parks : Increasing numbers of visitors now come to Chiang Mai in search of the natural environment preserved a famous national parks. Famous national park in Chiang Mai is Doi Inthanon,the highest mountain in Thailand. In most cases, you will find easy access and bungalow accommodation for overnight stays. 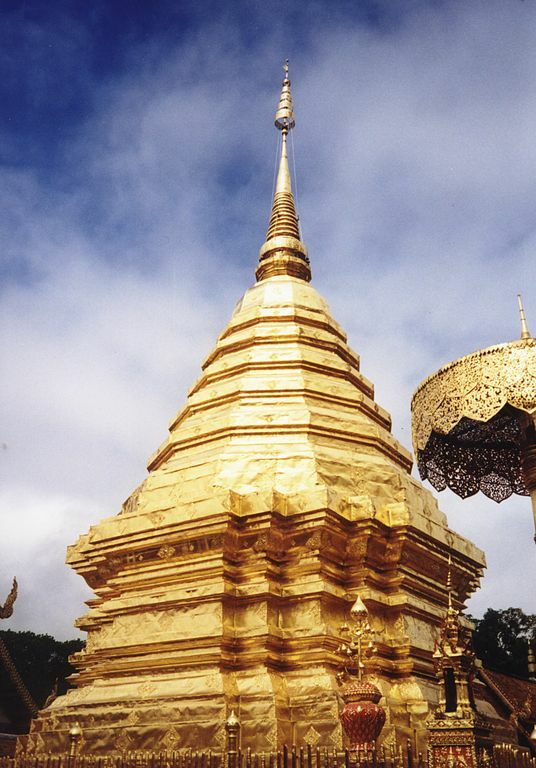 CULTURAL ATTRACTIONS:Â Chiang Mai is a blend of Cambodian, Burmese, and Indian cultures. 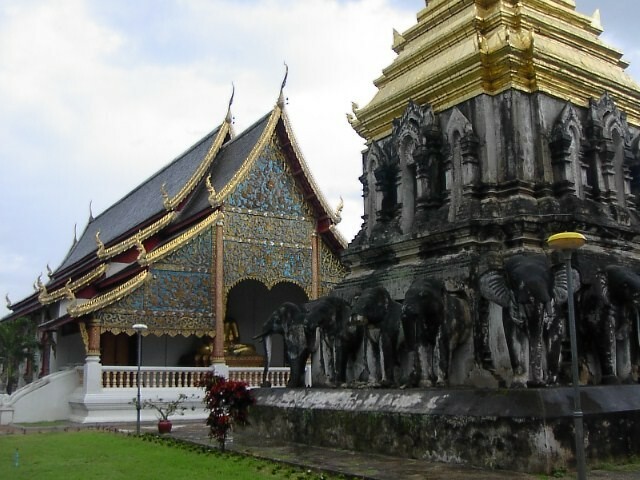 The result is the distinct Lanna culture and architecture that is still evident in Chiang Mai today. Wat Jedi Luang: Ancient temples can be seen almost anywhere in the city, withWat Chiang Mun being the oldest. 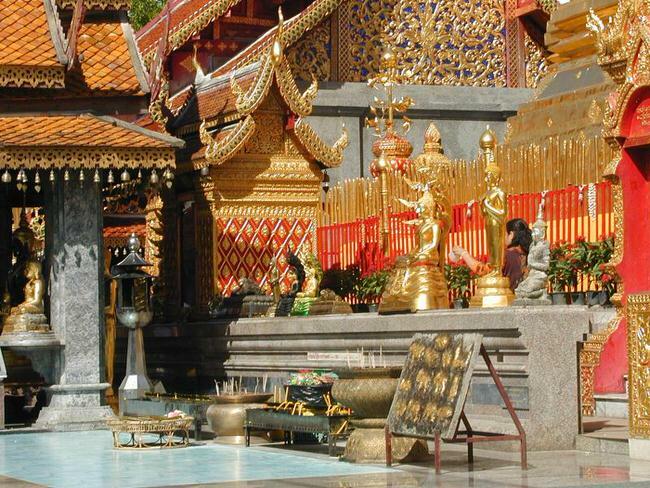 Near the top of Suthep Mountain is the famous Wat Prathat Doi Suthep Temple. Other temples of interest include Wat Chedi Luang,which houses the city pillar that traditionally marks the center of a town; Wat Pra Shing, which holds a much revered Buddha image that is one of Thailand’s oldest; and Wat Umong, which is a quiet meditational retreat shaed by majestic teak trees. In addition, there is also Wat Suan Dok, which are a few others among the many important temples in Chiang Mai. 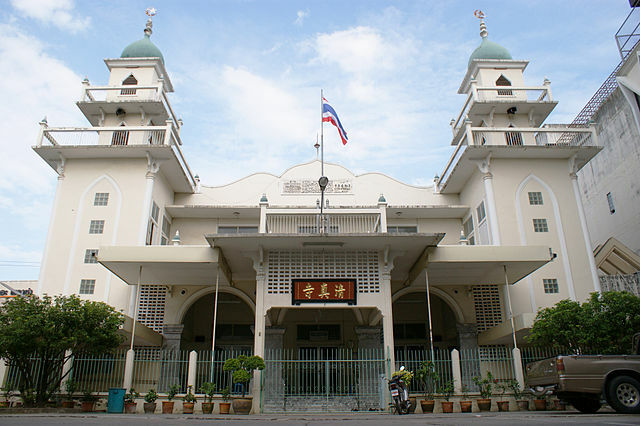 Besides temples, there are cultural attractions such as the Phuping Palace, which is home to the Royal Family during certain times of the year; the National Museum of Chiang Mai and Wiang Khum Kham, archeological remains of an ancient city located on the Chiang Mai-Lamphun Rd. ATTRACTIONS IN NATURE: With an abundannce of mountains, forests, and valleys, Chiang Mai has much to offer in the area of nature. Almost countless numbers of waterfalls, caves, mountain peaks, and national parks can be found in the areas surrounding Chiang Mai city. The Chiang Dao Cave and Brichinda Cave; Hom Pok, Angkhang, and Inthanon Mountains Aob Luang; Huay Nam Dung Mae Klang and Wachiratarn Waterfalls the hot springs of Sankampaeng; and the Huay Dterng Tao Lake are only a few of the natural attractions well-worth visiting. The large majority of these tourist destinations are under the authority of governmental agencies like the National Park Department, the Agricultural Ministy Co-op., and the Royal Forestry Department. While at some places a very small fee for maintenance of the park may be requested, there is usually no admission cost. For those thinking of spending the night, most of the parks have limited accommodations, if any at all, and permission must be obtain in advance for the use of these facilities. At present, however, privately owned accommodations are available near some of the parks and attractions. ELEPHANTS AND RAFTS:Â If you are looking for little excitement, consider an elephant ride through the jungle, available at different elephant Camp, and The Elephant Training Center, Chiang Dao. Another point of interest is rafting down the Kok River from Tha Ton to Chiang Rai. For a ride faster than the simple bamboo raft provides, you also have the option of the long-tailed speed boat. A veteran raft rider might also be interested in the Mae Tang and Pai Rivers. HILLTRIBES: Hill tribe villages provide the chance to observe diverse cultures and languages. Villages that are closer to and have greater contact with towns include the Hmong (Meo) on Pui Mountain, and the Mae Sa Mai Hmong on the Mae Rim-Samoeng Rd. If you are interested in observing hilltribe villages whose traditions, customs, and vocations are still intact and also in getting the chance to experience the adventure of the jungle, you must travel further up into the mountains. There are several tour guide companies in Chiang Mai that provide trekking services. Most treks last for more than a day, and involve spending the night in a designated hilltribe village. Prices vary by facilities provided and destinations. Call us at: 1 415 827 4981 to begin planning.